Huawei is an up and coming manufacturer, with a strong 100 million smartphones sold in 2015. The same Chinese manufacturer has also teamed up with Google for Android Wear and has launched its Huawei Watch that is one of the fancier smartwatches at the Google Store. Recently, though, the company announced two new smartwatches that cater to women: the Huawei Watch Jewel and the Huawei Watch Elegant. These two smartwatches run Android Wear, have the same specs and features, but come in a design that Huawei is hoping women will love. As a woman, I can understand Huawei’s move to make gender the “next big thing” with its smartwatch lineup, but there is both good and bad to the Chinese maker’s decision to push forward with two smartwatches that are catered specifically to women. As with everything, though, nothing deserves to be criticized until it’s first understood – so we’ll proceed with understanding why Huawei has decided to make these two new smartwatches before we think through the implications of such an idea. Smartwatches, like all of tech, are often considered to be a man’s field of interest, excluding ladies. Sure, women buy smartphones every day, but tech in and of itself is dominated by men. I’m a woman saying this, and it’s still true, even in 2016. I had a woman recently ask me how I could like tech specs, features, and smartwatches and other smart devices, and her bias about the field was terribly obvious: few women are drawn to tech. That isn’t to say that no women are, but the number of females in the field are few. Tech, it seems, isn’t necessarily gender-inclusive in the eyes of some. And then, there are those women who are interested in tech and smartwatches, but they don’t like the size and look of current smartwatches. I can tell you that in the last two years alone since the inception of Samsung’s Galaxy Gear smartwatch lineup, there have been a handful of articles on the fact that smartwatch makers seem to ignore women when it comes to smartwatches. I disagree, however: I wore the original Galaxy Gear in 2013 when wearing smartwatches wasn’t cool. Since then, I’ve gone on to wear the 3G-connected Gear S and now, the Gear S2. All three smartwatches have looked good on my somewhat small wrists, and again, I’m female. So no, I don’t think smartwatch makers have neglected women, but I do believe that some women feel marginalized in how smartwatches have been made and advertised in the last two years. They’re entitled to their opinion, though the last 3 smartwatches I’ve donned is clear evidence that I disagree with their view. So, it isn’t surprising to see Huawei create two smartwatches that cater to the ladies: the Chinese manufacturer wants to break into a field that few have embraced. 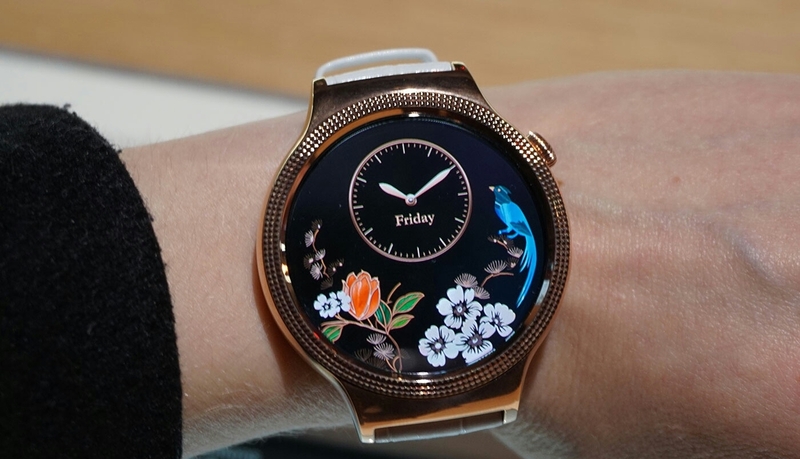 Sure, you can style your rose gold Moto 360 smartwatch, but it’s still called “Moto 360 2015 edition.” Huawei didn’t just craft these two new smartwatches under the “Huawei Watch” label; it added two new collections with two different names so that, when you think of “Watch Jewel” and “Watch Elegant,” you’ll only think of Huawei – and you’ll only think of these as feminine smartwatches. It’s a move that sets Huawei apart from the rest of the Android Wear smartwatch makers. 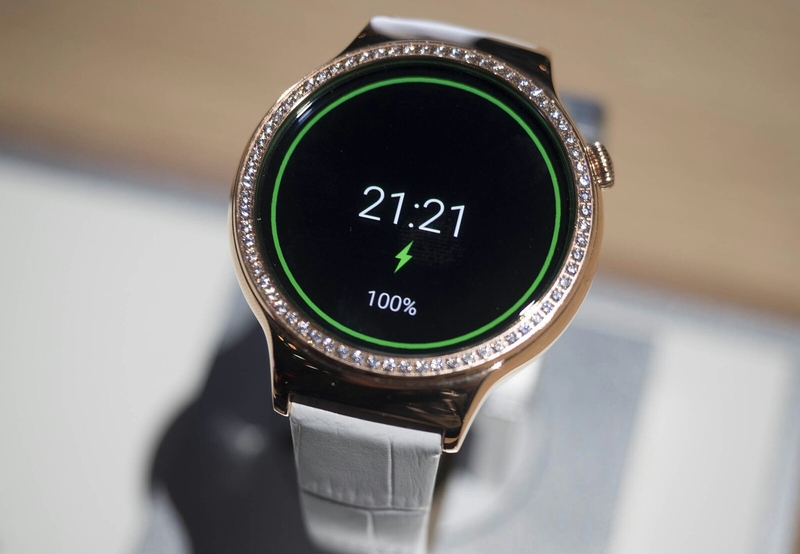 Motorola’s popularity ensured that it would be the first to blaze the lady smartwatch trail, but Huawei just stole some fame from what once was the most popular smartwatch maker in Android Wear. Huawei wants to “single out the ladies,” but there are some implications for this that are both good and bad. Sure, some women will pick up a Huawei Watch Jewel or Watch Elegant and wear it because it’s history-making: never in the history of smart devices has there ever been a smartwatch collection devoted entirely to women. The fact that it’s groundbreaking will draw some women buyers to make the purchase and don one of the new female smartwatches on the wrist. While this is good for some women who feel marginalized in the smartwatch market, few have yet to contemplate the problem or problems with Huawei’s decision. I think it’s time to detail them next. There are a number of men who’ve always felt as though the first-gen. smartwatch was a “man’s watch,” but Huawei just made it so with the introduction of these two female smartwatch collections. Huawei advertised the original for men, of course, but a lot of smartwatch manufacturers have used men in their commercials. While using men in advertising is nothing new for tech products as a whole, it doesn’t have the implication attached that smartwatches are only for men. In fact, if Huawei had never ever introduced the Watch Jewel and Watch Elegant, I could’ve seen myself buying the first-gen. smartwatch, wearing it because I love smartwatches. I think it’s good enough for my wrist (and female wrists) too, but that’s another discussion. With the Watch Jewel and the Watch Elegant, women now have two smartwatch collections to claim as their own. Huawei just created a divide that I don’t think is reasonable. Why should I feel as though I’m not “lady-like” because I purchase the original Huawei Watch? 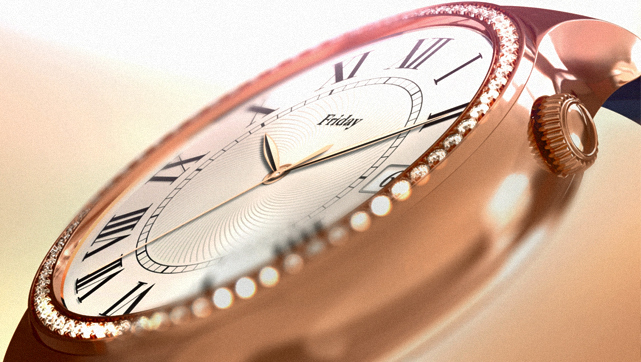 Why should Huawei’s Watch Jewel and Watch Elegant define how lady-like a woman is or isn’t? Can I not be a lady and wear the original Huawei Watch? The Huawei Watch Jewel and Watch Elegant are defined by the fact that they are distinctly feminine in nature. This, however, is at the heart of the problem: these two smartwatches have the same specs and features but are designed for female style preferences in a field that is called “tech.” In other words, smartwatches should be distinguished based on their technology and software, not gender. Whether or not I’m female or male shouldn’t determine what smartwatch I buy, anymore than whether I’m female or male should determine what car I drive or what desktop computer I purchase. Tech is tech, and if we’re “talkntech,” then gender shouldn’t be at the heart of the discussion. Of course, smart wearables of the future will bring up the idea of male vs. female sizes and styles, but even in those situations, not every male or female fits the mold. Take men’s and women’s ring sizes in college: men get bigger “rocks” on their fingers than do women, but is this ok? No, it isn’t. Women work just as hard as men to get their degrees; why can’t they have a ring with as big a rock as men? Are their academic achievements any less stellar because of gender? Somewhere along the way, someone wrote the “rules” of wearables and decided to cater to men on one side and women on the other, but this distinction doesn’t work for all individuals. Some men have smaller wrists than others, and some women have larger wrists than others. Some women also prefer more gender-neutral wrist wearables. What about those women when it comes to smartwatches? Huawei has made smartwatches for women, but the company needs to know that not every woman (and I’m one of these women) prefers a smartwatch distinctly made for women. It often sends the wrong message that women aren’t “tough” enough to wear a true smartwatch, and I don’t think that’s the message the Chinese manufacturer wants to send. My final thoughts on the Huawei Watch Jewel and Watch Elegant are meant to wrap up what I’ve said here. Sure, Huawei has crafted the Watch Jewel and Watch Elegant to appeal to women who rebel against the often-presumed “manly” look and design of smartwatches (the Casio WSD-F10 is such an example), and the company should be applauded for making an effort to reach out to a marginalized gender in tech. At the same time, I value gender-neutral smartwatches that don’t draw attention to gender because a large part of a smartwatch’s appeal is its gender inclusivity: whether or not men and women would both want to wear the same smartwatch. As a woman in tech who has witnessed gender bias in higher-up positions, I know for certain that the Huawei Watch Jewel and Elegant have little appeal to me. Working alongside of men in my field, and longing for equal treatment in the workplace, I wouldn’t want to strike up a conversation at work with the words, “Check out my Huawei Watch Jewel/Watch Elegant” while the men look at me and laugh at how “girly” my smartwatch is. But, then and again, I’m different than most ladies. Tell me women, what do you think? Do you think the Huawei Watch Jewel and Watch Elegant are perfect for you? If so, feel free to let us know. I’m dying to know your thoughts about these two new Android Wear smartwatches.